Discussion of the death toll during Eelam War IV and the related topic of “The Disappeared” has been marked by collective myopia. Most discussions have dwelt in cloud cuckoo-land. This criticism can be levelled at the witch-hunters in the Western international order (whether UN and Western officials, media personnel or Tamil migrants) as well as the liberal humanists within the Sri Lankan middle class supporting a range of allegations. However, it also applies to analysts and reporters in defense of the realm such as Rohan Gunaratna, Shamindra Ferdinando,the editors of Sri Lanka’s print and internet media and many defenders of the Sri Lankan dispensation in its moment of crisis. This charge would also apply to my thinking in the period 2009-11. This essay, therefore, is partly an exercise in self-criticism, one that seeks to pinpoint the bourgeois office-room background of many personnel in key institutions. This unexamined and fundamental weakness hinders evaluations of the complexities of the battle-theatre conditions in the Vanni Pocket in January-May 2009 – conditions that were a product of the LTTE’s grand strategy in crisis. While the detailed UTHR reports also attend to this set of figures and the significance of the wounded-to-dead ratios, their review is vitiated by (1) a facile acceptance of the estimates of the dead on this or that day provided by escaping civilian informants and (2) a rigid adherence to the distinction between “cadres, conscripts and civilians” – a sterile office-desk perspective that does not recognize the fact that quite a few Tiger “cadres” (fighters) had been conscripted at some point earlier and that all civilians conscripted in 2008/09 for logistical support duties (whether cooking or transporting or digging) were “belligerent auxiliaries” in support of the LTTE war efforts. In an incisive and lengthy study Peiris (2014) has decoded the methodologies underpinning the calculations of the death toll in all the surveys in the period 2009-13. However, it is the study (2013, 2014) by the Sinhala British professional executive writing anonymously as “Mango” that I deploy here because it is succinct, incisive and amplified by graphs and images. Thus guided, one could not ask for a better illustration of the intellectual shortcomings of the professional classes and academia worldwide than their writings and speeches on this topic. Entering the unfamiliar terrain of casualties in battle theatres, hardly any of them are aware of the critical categories “KIA” and “WIA,” (with “MIA” enfolded here within KIA). Any mother’s son of a soldier or father’s daughter of a soldier is alive to the fact that in most battle theatres the number WIA outnumbers that of KIA (inclusive of MIA). Depending on terrain, weaponry and battle, the ratio can vary widely: WIA is usually at least twice as much as the dead, but can even be 13 times as much according to the first groundbreaking study of war statistics in the period 1940-88 presented in the British Medical Journal in 1999 (Mango 2013 and Engage Sri Lanka 2013: 142). The US Army ratio of wounded-to-dead during the Vietnam War was 4.45 and in the Korean War 4.02; while the figures for World War II (excluding USAAF) was 3.57 (Lawrence 2016). After the intense battles over 18 months within the restricted space of the Gallipoli Peninsula in 1915-16 the (Western) Allies counted 56,707 Dead and 123,598 Wounded — so that the ratio of Wounded to Dead was 2.18. The Ottoman Empire however lost 56,643 personnel and had 107,007 wounded so that their proportion of wounded at 1.89 was relatively unusual (see Appendices at end of essay). The SL Army’s history in Eelam Wars II and III in the 1990s was appalling: the numbers deserting and the numbers killed or missing were large. This was due in part to half-trained men being sent to fight, but poor strategic thinking from Generals Ratwatte, Daluwatte, Balagalla and Weerasooriya seems to have been the principal reason for these failures. The debacle at Mullaitivu on 18-20th July 1996 is a case in point: two regiments of soldiers and a small detachment of Navy personnel were totally wiped out, leaving an estimated 1200 dead. The attempts to capture LTTE territory through “Operation Jayasikuru” in the late 1990s also ended in several military disasters. Unsurprisingly, the ratio in Eelam War IV was far better: 5,847 died in battle or were missing and presumed dead, while 18,668 were wounded, so that the proportion was 3.19. However, the LTTE’s greater use of heavy artillery and their liberal use of mines to restrain the SL Army’s advance during this phase has meant that a high proportion of the wounded are severely disabled – as many as 14,000 over the whole of the Eelam Wars according to grapevine information. Placed against this fundamental background consideration, we can see that the so-called specialists in the United Nations Panel of Experts did not address a central issue when they announced that the allegation of “40,000 [Tamil] civilian deaths” was acceptable because it was indicated by “a number of credible sources.” Where, then, were the 70,000-100,000 or more wounded Tamils? Or even a lesser figure of 40-50,000 wounded? The vast bulk of Tamilian casualties occurred in the war theatre during the period January to May 2009, though we must also attend to disappearances elsewhere and embrace a much broader temporal span extending beyond 19th May 2009 when considering the subject “Missing”. This temporal moment in Eelam War IV, viz., from roughly mid-2008 through to May 2009, differed fundamentally – and tragically – from the battle theatre in the Vakarai region in the eastern front in 2006/07 where the LTTE’s attempt to utilize the civilians as shield failed. Unlike those in the east, civilians in the northern Vanni districts of Mannar, Kilinochchi and Mullaitivu had a fundamental distrust of the Sri Lankan state (GSL) and/or favoured the LTTE deeply at that particular stage of the conflict, namely, early 2008 — the point when GSL military forces succeeded in making inroads into the terrain commanded by the LTTE. Spurred by their bonds with the LTTE and encouraged by the Catholic priests in their midst, the Tamil people obeyed LTTE orders and moved eastwards and northwards into the safe terrain of Thamilīlam. Initially, this was well ahead of the fighting. However, as Thamilīlam contracted in the face of GSL advances they found themselves wedged within “the Vanni Pocket” in the north-eastern corner of the island by January 2009 (Fig. 5), an area of roughly 2470 sq. kilometres that was subject to steady reduction over the space of the next 4 and one/half months. Where “civilian” casualties were minimal before that stage in 2008, from early January 2009 the populace of perhaps 320-340,000 civilians and Tigers were in increasing danger of death and injury. As before, moreover, the distinction between “civilian” and “belligerent” (war crimes terminology) was blurred. Many Tiger fighters did not wear fatigues and fought in jeans, shorts and checked shirts – and even in tucked-up sarongs. Note, too, that from way back in 2005 civilians had been trained as militia in the makkal padai. Throughout 2008/09 the LTTE pursued rigorous conscription and deployed civilians in belligerent roles as cooks, carriers, and ditch/bund builders. In brief, some people who considered themselves “civilian” would have been categorized as “belligerent” in international tribunals. The most critical facet in retrospect, however, is the fact that the LTTE manoeuvred their own people into this situation as part of their politico-military strategy. This has two dimensions. One is widely recognized and presented as a policy of “using the people as human shields.” It would be more precise to rephrase it as the deployment of people as a defensive formation and just so many sandbags. However, that was another vital, dimension in the LTTE’s master-plan: the primary purpose of the civilian mass was directed towards building up an international propaganda campaign on the platform “an impending humanitarian catastrophe.” Perhaps unwittingly, the LTTE handmaiden Frances Harrison has let the cat out of this bag: she indicates that her pal “Puli,” as she calls him, namely the Tiger political chief Pulidēvan, “told European friends that, just as in Kosovo, if enough civilians died in Sri Lanka the world would be forced to step in” (2012: 63). There was a temporal dimension in this scheme. With the General Elections in India looming in mid-May 2009 the LTTE hierarchy were hoping that this strategy would keep their rule over the remnants of Thamililam in place till that event potentially generated better prospects of intervention fostered by Tamilnadu supporters. This design was intended to draw the Western government, the UN, the leading human rights agencies (for example, AI, HRW, ICG) and civil rights bodies within Lanka into vociferous action in support of a ceasefire and/or international mediation/intervention. This strategy was a resounding success. As the Marga think-tank’s team has argued, the Sri Lankan Tamil diaspora was a powerful lobby in many Western democracies and their propaganda impacted “on the attitudes and policies of the Western government” (2014: 110). Influential journalists and powerful media chains became active agents in pursuit of this intervention policy. The series of demonstrations and public rallies marshaled by Tamil migrants and their supporters in Toronto, London, Sydney, Canberra, Geneva and elsewhere added urgency to these multi-faceted endeavours. Several of these rallies were vibrant affairs. Add the media support and the influence wielded by liberals and Leftists converted to the Tamil cause in the West and one can speak of a propaganda juggernaut in key arenas in the West, Australia and South Africa. Note that, a little earlier in March 2009, P. Saravanamuttu had castigated the LTTE for “its barbaric excesses;” but in the next breadth he slapped the government on the wrist for artillery fire that had hit medical facilities and injured civilians as part of an accusation that GSL strategy was not “containment” but elimination of the LTTE. In other words, the head of the Centre for Policy Alternatives not only desired the military to fight without resort to any artillery or mortar fire, but also by-passed the LTTE’s grand strategy with its temporal element geared to the Indian General Elections. So, in overview, we see that the HR agencies and the most powerful governments in the world, to wit, USA, UK, France and the Scandinavian countries, intervened actively in the political maelstrom around Sri Lanka, supported by the UN bureaucrats who were in their pocket – from Ban-Ki-Moon to Navy Pillai, Vijay Nambiar and others. When Hilary Clinton took over the reins as Secretary of State in USA in early 2009, she pursued this programme of intervention-threat with gusto – with Samantha Power by her side. One cannot comprehend US policies towards Sri Lanka without attending to Samantha Power’s treatise in A Solution from Hell and the jingoistic moral fervour displayed in her various missions. One glaring instance of this blinding zealotry in the wielding of power was when Clinton directed a tongue-lashing at the government of Sri Lanka on the 22ndApril 2009 for engendering “a terrible humanitarian tragedy” about 36 hours after all the Western ambassadors had been shown real time aerial footage of some 100-110,000 civilians streaming across the shallow parts of Nandikadal Lagoon to safety in the wake of a remarkable SL Army military operation launched on the night of the 19th April. In brief, the self-appointed “international community” led by USA was not on the sidelines. They were a party to the conflict. So, too, in similar yet dissimilar ways, were all those HR agencies abroad and in Sri Lanka who took up this line of demand: namely, asking GSL to cease using artillery and to arrest their advance under threat of retribution, while yet being resigned to the fact that the LTTE would never accept any ceasefire. The leading civil society advocates in Sri Lanka were drawn into this body of thought. 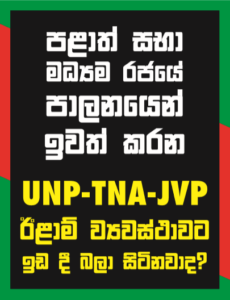 Thus, two years later, several prominent intellectuals endorsed the UNPoE Report after it was presented in March 2011 – leading Godfrey Gunatilleka to resign from the Friday Forum in fundamental disagreement with a reading endorsed by such individuals as Chandra Jayaratne, Jayantha Dhanapala, Deepika Udagama and Savitri Goonsekere. It is an irony of world history that parties to this conflict have been sitting in judgment on criminal issues arising from that conflict. That is today’s realpolitik. When Mango (2013) identified “a truly appalling misuse of civilian casualty numbers by international humanitarians, whose jaundiced view on Sri Lanka’s victory has led them to disregard basic mathematics, statistics, facts and logic,” he was pinpointing a species of intellectual myopia in high places. But the indictment can go further. There is a prima facie case to indicate a policy of deceit guided by the ploys of power at the heart of the international combinations. In levelling criticisms at both the LTTE and GSL at this function, Frances Harrison reiterated the cavalier position adopted in her book: serving up a bizarre cocktail of figures for the death toll, namely, 40,000, 75,000 and 147,000 (the latter with all the pontifical weight of the “Bishop of Mannar”). Despite her background as a Cambridge graduate with years of experience as a BBC reporter and some service in Amnesty International, Harrison did not have the pragmatic common sense to seek figures for the civilian wounded – a search which would have led to the local UN computation of “18,479 injured from August 2008 up to 13 May 2009” (above). However, there may have been a clever sleight of hand in her crazy jumble of figures: readers leaning towards empirical fact could have dismissed the gross number 147,000 as silly and opted for the lowest figure of 40,000. A neat trick if intended and quite effective even without intent. Take note, too, of the deployment of the “we” in Sooka’s pronouncements on the estimated civilian death tool. The “we” does not embrace Harrison alone. It can be extended to the international cabal of UN diplomats, ICG personnel and human rights advocates at HRW and Amnesty International seeking to effect regime change in Sri Lanka. Indeed, this goal was voiced by Keenan at the same occasion, Harrison’s book launch: “Together, cumulatively, with effective lobbying, we can keep the Rajapaksa regime and those associated with them on the defensive and ultimately, I think, as political developments happen within Sri Lanka and outside, there will be a moment when they are not reigning supreme as they are now, then these issues come back to bite them” (quoted in Peiris 2014). Thus, to sum up: where the UNPoE Report on 31 March 2011 had presented a figure of 40,000 as a possible death toll, that is, as an allegation that was “credible,” now in October 2012 we witness Sooka, Harrison and others bumping the figure up to 70,000 and 75,000. The total of 70,000 dead was (is) precisely the figure plucked out of thin air by the Charles Petrie, the British diplomat become UN apparatchik, in a second report in November 2012 – presented about the same moment as the Harrison book launch. Both the serendipity of these timings and these parallel figures can be treated as an impersonation of the mythical Sherlock Holmes in conversation with Dr. Watson. In Gerald Peiris’ exhaustive study we have our real-life Sherlock Holmes. He unpicks the methodologies underpinning a range of studies and bodies of evidence relating to civilian and Tiger casualties. A particular problem is that of distinguishing Tiger-and-civilian belligerents from non-belligerent civilians when injured persons were brought to the hospitals overseen by the LTTE and thereafter (in some cases) unto the ICRC evacuation ships – one among several shortcomings in the earnest efforts of the UTHR collective in its surveys of the war scenario. After delineating the UTHR’s slipshod methodology, Peiris asserts that “a few of the UTHR-J reconstructions …, sad to say, are as melodramatic as the ‘Kollywood’ creations in Tamil Nadu” (Peiris 2014). [I have pinpointed moments] where moral crusaders and agencies with “human rights” emblazoned on forehead indulge in detailed studies of the war which systematically refuse to encompass several detailed studies that would reveal flaws in their documentation.One such illustration is the document Island of Impunity? Investigation into International Crimes in the Final Stages of the Sri Lankan War presented by the Public Interest Advocacy Group of Sydney. When ethical forces are intellectually dishonest our future prospects in this world are dismal (Roberts, “Down-to-Earth,” 29 October 2015). The humanitarian campaign directed at war crimes has on occasions promoted a strange phenomenon: where people of ethical stance indulge in outright lies as well as the massaging of facts. When Amnesty International, the Public Interest Advocacy Centre (Sydney) and such moral crusaders as Gordon Weiss descend to such duplicity, the world must surely take note. (Roberts, “A Puzzle,” 16 June 2016). Set within this broad background, we can get down to the stark details relating to deaths and disappearances. From early January 2009, a body of 320-340,000 Tiger fighters, civilian belligerents and civilians were hemmed in within the decreasing corner of the north-east that has been termed “the Vanni Pocket” and were subject to injury from shell fire, aerial bombardment as well as cross-fire as SL Army forces penetrated the arena over time. As the SL Army advanced into this space some civilians decided that enough was enough and deserted Thamililam by seeking to cross the battle lines on land within the cover of darkness. Inevitably, they were exposed to injury by cross fire and on occasions were subject to automatic rifle fire or artillery fire by the Tigers themselves. A few may conceivably have been killed by snake bite because the Vanni is notorious for its venomous snakes. On a few occasions, especially in April and May 2009, escapees were also subject to attack by suicide bombers –the first of these being a female suicide agent of the Tigers who joined a body of escapes and detonated herself at a rear base checkpoint on 9th February 2009, killing 29 and injuring 64 — these casualties being a mix of SL Army personnel and Tamil civilians. As their situation became hopeless from circa 12/13th May the remnant Tiger fighting elements prepared to die fighting, The UTHR reportage indicates that they turned their guns more often on the civilians around them in the sandy scrub terrain and mangrove swamps of that corner of the Last Redoubt. People drowned when crossing the Nandikadal Lagoon at some of the deeper spots. People died or drowned at sea when their boats were shot at during night-time attempts at escape. People were totally buried in collapsed bunkers or ditches. Corpses decomposed in jungle and shrub or were devoured by jackals, reptiles and termites. Corpses deteriorate and are food for some creatures. In stark summary, therefore, the likelihood of ascertaining whether missing Tamil person X or B or T has died with any certainty and/or specificity is nil, absolutely zilch. It is not adequate for a sympathetic listener to tell a parent or kins-person of a “missing person” that the task is apahasui (difficult) … or கஸ்டம் in Tamil. There must be a definitive answer conveyed with as much sympathy as feasible: “s//he is dead” and “we cannot entertain any hope of finding a body; in war some soldiers end up MIA; in battle theatres people will end up missing.” The authorities must then provide certificates to underline the message, secure closure and aid administrative requirements. This essay underlines the centrality of the studies of Wounded-in-Action presented by Mango and others in the controversy about the likely number of Tamil civilian deaths in the last stages of Eelam War IV. I am arguing that much greater weight should be attached to this method of assessment by those challenging the fanciful claims of the Tamil Eelamists and assorted “people of righteousness” with limited experience of battle theatres. The failure to take the available UN figures on the Tamil wounded in mid-2009 into account in death toll estimates underlines a fundamental shortcoming in the various committees, panels, writers and reporters who have addressed this knotty issue: namely, their bourgeois upbringing and unfamiliarity with the nitty-gritty of war. In other words, their middle-class urbanity was — and still is — a blinding disability. In the result, a whole cohort of educated personnel has ventured firm conclusions in a field which requires specialist expertise. They have pursued this agenda without resort to common sense. At the international level the proclamations of some players have been deeply contaminated by the power-plays of the US-UK combine which dictates – and continues to direct – the pious proclamations of UN minions ensconced within their bedroom. At this level and in these specific quarters, there is a prima facie reason to believe that the gross failure to take note of the available figures on the wounded Tamils in Sri Lankan hospitals is not a simple error of assessment, but, rather, an act of deceit.